It is always a joy to see our youngest students gaining the independence they crave in each of our three dynamic and nurturing classrooms. One of the pillars of the Montessori Philosophy are the multi-age groupings. For that reason, all 3 of our preschool/Kindergarten classrooms have students who are 3/4/5 years old and the student stays in the same classroom for all 3 years. This allows the guide, student and family to get to know each other very well and gives the guide the opportunity to provide presentations (lessons) to each child at a level that is perfect for them as an individual. The BC curriculum is fulfilled with the traditional Montessori approach with all its materials. At this level, the day begins with a block of time for free choice in activities. This is when the child uses the Montessori materials that they have been introduced and the adult is a keen observer and guides the child into use of materials which will satisfy the emergent sensitive periods of development. Each day includes time outdoors, circle time, snack, lunch and each week is enriched with gym, french, music and art. 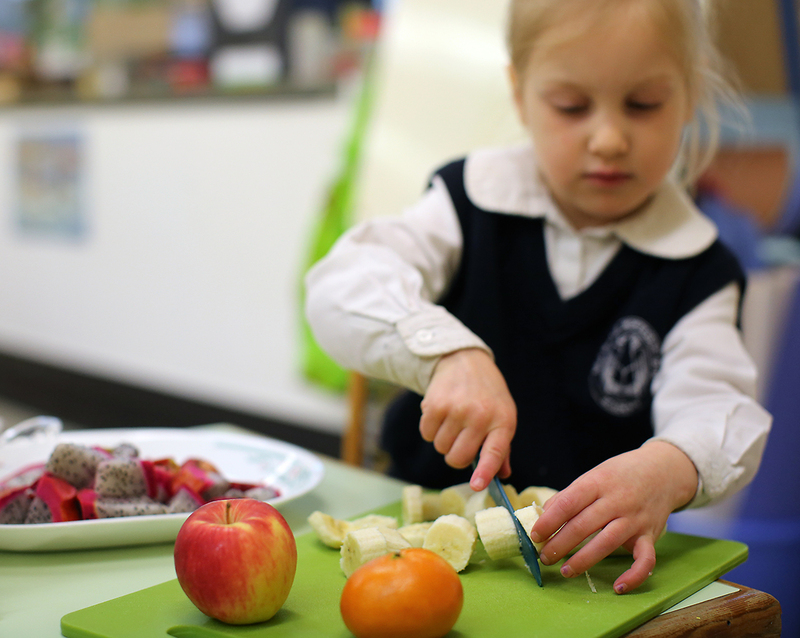 The preschool and kindergarten program focuses on four main areas of study: Practical Life, Sensorial, Math and Language. In addition, students are instructed in Grace and Courtesy. This is an integral Montessori element where students learn how to interact in their community in a polite, social and appropriate manner.